I swear, when it comes to gift giving, Doug takes all the fun out of the process. He does this, I think, just to make me mad. A few things to understand -- one, we both go out of our way to find just the right gifts for each other; two, Doug is a great gift giver; and three, Doug is a horrid gift receiver. He's also a little hard to buy for as he usually just goes and gets what he wants. I am always getting asked what he wants and I never know what to tell people. He is supposed to be making a list, but it could be a bit before that happens. There have been a few times when I have gotten him great gifts, like a certificate for a glider ride, or a day at the spa, and he doesn't use them before they expire. I've learned now not to get those things for him, or if I do, it's not a gift certificate, I actually book something for him. This morning I call Doug. "You are getting the BEST Christmas present," I tell him. "It's really awesome, don't you care?" "Not really, Christmas is too far away. The present is out of my control." He's got me there. "But it's so cool, I'm dying to tell you, but I won't." This is true. I have a hard time keeping gift secrets because I think they are cool. Once, many years ago, I told Doug I was getting him a puppy, just so I had something to focus on. In reality, there wasn't a puppy, but instead, a surprise party for his birthday. However, I did have him convinced so much that he even thought he heard the pup in our bedroom. "You know," I continue, trying to bait him, "you don't even know if this present is from me, your mom, your aunt or someone else." "This is true, but it's still out of my control." Ugh! He makes me so mad. How much fun is it keeping a secret when the other party just doesn't care? I know it still seems early to be thinking about Christmas, and we are both so busy in the next two weeks, but please, play along with me. It takes away all my fun if you don't. I swear, he does this just to aggravate me. But the present really is cool. Sometimes I wonder if students realize that teachers too are counting down to the end of the semester. I'm at the point where each day I'm ticking off how long is left. For me, it's two more days of classes before finals. With four classes, I'm teaching more classes than some of my students are taking. They may have tests, projects and papers, but we teachers are the ones who have to grade them all. Starting tomorrow, I will be a grading maniac, trying fast and furious to get things graded, all the while still prepping and writing the finals for my classes. In the meantime, I have students begging for second chances, asking what they can do to bring up their grade. Or others, arguing that something is "not fair." Students are still at the point where they don't realize how tough the world really is. Of course, in the meantime, unlike them I am an adult and have responsibilities. Holiday shopping and planning, Christmas cards (the pressure of picking the right ones and making sure the list is updated and no one is left out) and decorating. Where do we put the tree this year, as the kegarator is in the spot we normally have the tree? Then there are the Christmas parties. We've gotten invitations to three thus far and are checking schedules before we RSVP. And travel reservations and who will watch the dogs. Doug is good in providing input and doing specific chores when nagged, but writing and addressing Christmas cards, or hanging garland around the house, is just not his forte. Luckily, he can get boxes out of the attic and string lights on the tree. I am so ready for the semester to be over, but I'm not ready for the holidays. Why must one come with the other? Doug’s folks have been here since Wednesday and it has been several busy days. You can read details of our travels Barbara’s blog. When not out doing something, Jim, Barbara and Doug have been watching football. I’ve never really been able to watch sports on TV, even football, so I have been using the time to play elf and work on Christmas presents. I had prepped several side dishes yesterday. They were in the fridge, ready to be popped into the oven. The other stuff were simple and I could throw them together on the stove. I had my digital thermometer plugged into the bird. Not only did this save me from over-cooking the bird, it also allowed me to pace when I put those said side dishes into the oven so that they would be ready when the bird was. Overall, it was a pretty stress-free day in the kitchen. Doug's parents arrived yesterday from Chillicothe. There was enough food to feed 10 people, unfortunately it was only the four of us. Damn, Tyler Florence for making everything look so yummy on TV and being so good looking I want to watch you cook. I made his turkey, his sweet potato casserole (Cindy, we forgot your suggestion to add the rum, darn it! ), his cranberry orange sauce, his pumpkin cranberry pie (Cindy, your suggestion for the cranberries worked great), and a variation on his gravy. Pretty much the only thing on the table not from Tyler Florence was the stuffing, the spinach artichoke souffle from my friend Claudia, and the mashed potatoes. Did I mention we have a TON of leftovers?!? Other than that, the day was fairly quiet. Doug is watching his third football game for the day, the Chiefs vs. Broncos. I'm uncertain whether he wishes he was in Kansas City or not. While he and his parents watched tv, I was working on Christmas gifts. Tomorrow we plan on bumming around a bit, hitting a few speciality stores but nothing major. Doug's dad wants to watch a few of the college games tomorrow. There really isn't a lot going on tomorrow. I think between Black Friday and the Texas/Texas A&M game here in town, no one is putting on special events. Saturday, however, we plan to go to a few different street fairs/art festivals in town. As any of our regular readers (meaning our moms, other family members, and friends who we harass to read) know, there are two things that are true: 1. I am a blogger; and 2. Doug loves beer. No only do I blog, updating a few times a week, I research blogging, specifically how blogs are used in public relations and mass communication. Want to know about bloggers as opinion leaders? Ask me, that was my thesis. I won’t claim to be the end-all, be-all of blogging, but I know more than the average bear. Virtual communities, opinion change and blogs spark my imagination. As for Doug, he is not the typical beer drinker. He is a beer connoisseur. Want to know the difference between a stout and an IPA? Ask him. With Doug, it’s not just about the drinking of the beer, it’s about the experience. This is why he became a homebrewer. His stuff is good, better than many of the commercial beers available in Texas. One reason is his curiosity about beer – he’s always reading brewing magazines and you never know when he’ll suggest a day trip to the Spoetzl brewery (Shiner beers) or some brewpub. Last Sunday we drove to Blanco to tour the Real Ale brewery. This tour was unusual as they allowed Doug to climb on the catwalk and see how the whole process worked. Doug thought this was real cool. His only disappointment – the tasting room was out of Fireman’s 4, one of his favorite brews. Other things that are true: we like to travel, we like to go to festivals, we like to tour wineries and we like to attend and throw parties. This is why when we saw this article, we knew we had found our perfect job. What could be better suited for us than to travel across the country, going to festivals, touring breweries, sampling beer and then blogging about it? Starwood Hotels, the company behind the Four Points by Sheraton hotel, is looking for a Chief Beer Officer. They want someone to travel, sample craft beers, represent the hotel, promote the hotel’s Best Brew program and then blog about. How cool would that be? We’ve already talked about creating a blog, and then maybe a book, about Texas brewing. Might as well expand that nationally and get paid to do it. We’re hoping that Starwood will like idea of couple blog team. If anyone has an “in” at Starwood, put in a good word for us. As of today, Doug and I have been together 8 years. We are going to have a quiet celebration tonight. Work has been so hectic for both of us that we didn't want to do anything big. The IKEA opens today in Round Rock. It's the first in the area and third in Texas. Folks have been camping out in front of the store since Monday. I'm curious to shop in the store, but not that curious. General Hospital's Luke & Laura are renewing their wedding vows after 25 years. As my mom reminded me in an email yesterday, I checked out of school to watch the original. Truly, I think stupid stuff you did 25 years ago shouldn't still be held against you. Quite honestly, it's been 15 years since I've watched a soap opera. Speaking of soap operas, this time of year turns into a student soap opera. I get all sorts of stories on why students haven't been doing well and why they deserve a chance to bring their grade up. With other stuff going on, I had several tough conversations yesterday. I also had a guest speaker cancel on me last minute. Let's just say yesterday was rough and I'm glad it is over. No update on Doug's job situation. Every week he thinks it will his last. It probably will be in the next few weeks. He has had some interviews, but everyone is waiting a few weeks. Doug's parents are coming next week for Thanksgiving. I'm just looking forward to not having a pile of grading. Every weekend for the last few weeks has been a huge stack of grading. Even this weekend will be 30 papers, project brochures and a stack of case studies. I am looking forward to a few days off for Thanksgiving. Of course, everything piles up again on the 30th, which is the last day of class. Yes, teachers count down to the end of the semester as much as the students do. My thesis advisor has asked me to consider turning my thesis into a series of papers and presentations. He is willing to work on it so we can get it done; he thinks we can get some of the work published. I'm actually juiced about the idea. I was prepping my final lecture about PR trends. This is where I discuss blogging and new technologies. Every semester I have to update this lecture, especially this semester. Last semester You Tube was a passing mention regarding viral marketing; this semester it is a part of our discussion, along with social marketing and Web 2.0. I thought Rick Perry's radio spots spoofing the Bud Light "Real Men of Genius" campaign were negative, but they can't hold a candle to the ad below. The Statesman reports that the bimbo asking the senator to call her is an Austinite. Curious, I went to YouTube to see the commercial. It has to be one of the most negative political ads I've seen in a long time. No wonder the candidate lost. Commercials like these make us laugh, but one has to wonder when the negativity going to end and what impact it has on us and our society. Someone on YouTube recut the movie trailer to make it a slasher movie. Seriously, I could see this happening too. I think, however, you have to be a real Office Space fan to get this. It's 7 a.m. Everything is quiet; the hustle and bustle of the day has not yet begun. I am one of the few on campus at this time of the morning and am trudging up the steps to my building, bracing to face a full day of teaching. This time of the semester the days are speeding up exponentially and the teachers are as busy and worn out as the students. We are near Thanksgiving, but the weather hasn't complied. It's foggy this morning, a nice change from the mugginess. The high will be in the 80s. Something catches my eye and I stop. 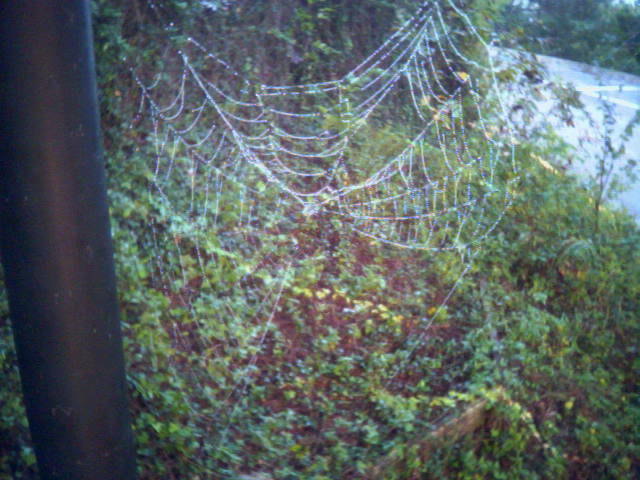 I spider web glistens with morning dew. I can't remember the last time I saw something so intricate and beautiful. I take a photo with my cell phone. It doesn't do it justice, but I know by the time I can get a real camera, the web will be down, cleared away by someone trying to clean up. Life is short; now is all we have. Enjoy the quiet beauty of nature while you can. Fall is a great time in Austin. A few weeks ago it finally cooled down enough to turn off the air conditioning and open the windows. The nights are cool, at times down right chilly, but the days are sunny and in the 70s. We are even getting some rain--not enough to declare an end to our draught, but still a relief from our long, hot, dry summer. This afternoon Dexter joins me in my home office. 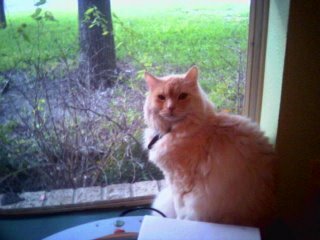 I'm grading papers while he spies on the outside world, wishing he could sneak out and enjoy the great weather. This weekend we were one of the millions to see the new Borat movie. While we used to go to the movies every week, this year we haven't. Nothing really sparked our interest . Until now. Borat was hilarious. We went Friday evening and it was a great way to end a stressful week. We haven't laughed so hard in a long time. I would recommend seeing this one in the theater, simply because it's the type of movie where audience reaction is key. I’ve been wearing glasses since third grade. If it weren’t for innovations in optical technology, my glasses would be 10 pound Coke bottles and I would be a bigger nerd than I already am. When I was in 10th grade I finally got contacts and haven’t taken them out since. I still wear glasses around the house, but vanity, thy name is woman and my preference is contacts. This is why I’m having such a difficult time adjusting to the fact that I now, at least occasionally, have to wear low-level reading glasses. There, I’ve said it. Two weeks ago Doug and I went to the local Mexican Flea Market, on Hwy. 290. Any cheapo thing you need, they have it. Doug was looking at a much needed pair of sunglasses. He’s forever losing his. While he was looking at sunglasses, I noticed they had reading glasses and started trying on a few pairs. I finally found a pair of 1.00x that were kind of cute, or at least not horrid. I’m not sure what 1.00x means, but they were the ones that worked best; 1.25x were just a bit too strong. While I was adamant that didn’t need them to read, I was still very depressed that I even needed them for beading. The vendor took pity on me and threw in another pair for free. I’m not sure if Doug was playing a cruel joke, but the second pair, a snazzy red number, ended up in my book bag with all the student papers I have to grade. They are on my desk at school, in case I ever break down and decide I have to use them for more than beads. Of course, the last couple of weeks have been crazy busy and making jewelry has been out of the question. Working with the students, I don’t feel old, unless of course I make references to things they know nothing about (like carving Ivory soap figurines in Girl Scouts) or I start thinking how they weren’t born until I was in high school. I figure mid-30s isn’t that old. Then IT happened. The culmination of the glasses and growing old. I was mistaken for a mother of a college student. Immediately I turned to glare at this student. She was young, looked like a freshman. I stared her up and down, trying to burn her image in my mind in case she was a PR major and took my class. I turned back around, grabbed my food and credit card, and walked off. Either I look way older than I am, or this girl thought I gave birth at 14. My student, realizing her friend’s faux pas, rushed after me. “Ms. Q, there is no way you look like you are my mother!” The rest of the walk to my office my student tried to reassure me that the other girl was just an airhead. I’m still not sure I buy it. Last night didn’t help either. Doug and I volunteered for the opening night of Plaid Tidings at the Zachary Scott Theatre. Before the show we had dinner at Austin Java. Because service is quick and we had time to kill, we thumbed through this week’s Austin Chronicle, the arts, entertaining and alternative political newspaper. The dim lighting in the restaurant, combined with the 9 pt. Helvetica type the Chronicle uses, did a number on my eyes. I gave up trying to read any article and looked at the ads instead. The reading glasses would have been handy, but I’m definitely not at the point where I’ll carry them with me at all times. After all, I’m only in my mid-30s. I’m not ready to grow old yet. Here's a neat Web site that tells you how many people in the U.S. have your name. According to the site, there are 10,499 people with my first name and 3,630 people with my last name, but 0 people with my first and last name. I guess my name is so unique that I don't even exist. Then again, how can I exist when my mother doesn't? I searched both her married and maiden name and got 0 matches. In fact, according to this site, there are 0 Voithofers. Not sure how that could be when my great grandmother had 16 children -- that should have been enough to make a dent in any database. Before you think that no one exists, there are 16 people in the U.S. with Doug's name; use his full first name, and it goes up to 143. If you search for Doug's dad, using his full first name, there are 1,298 -- I bet Barb (382 people) is glad she only has to deal with 1 Jim. Yesterday was a busy day, as is every Tuesday for me. Needing to talk to other faculty members, it was 5:30 before a left the university, which was still earlier than many days. It wouldn't have been bad except the Halloween commute was hell. I hit south Austin at 6 p.m. and it took until after 7 p.m. before I crossed the 15 miles to the north side of town. Stuck in traffic, I called Doug. "You aren't going to believe what the dogs did," he started. They got into the Halloween candy for the trick or treaters. It was high on the counter, but they managed to get the box and eat two dozen full-sized chocolate bars. "Are they alive?" I asked, having always been told chocolate was lethal for dogs. "They are lucky I haven't killed them," Doug answered. After 5 minutes of my questioning him, I hung up and called the vet. The vet was gone for the day but the assistant tried to answer questions. She said she thought milk chocolate was better than dark or baking chocolate, she didn't know what symptoms I should look for and suggested I call the emergency veterinary clinic. I go through the story again about the dogs, including their size, the type of candy and how much they ate. I'm put on hold for a few minutes as they are asking my questions to others at the clinic. Finally I'm told that is a lot of chocolate for the size of our dogs. Since we didn't know exactly when in the day they at it, don't worry about inducing vomiting. It could be they ate it in the morning and have been throwing up all day. We were to expect vomiting and diarrhea and to make sure they had plenty of water. We were also supposed to watch for extreme lethargicness or hyperactivity. At this point, there was little that we could do, but if the symptoms seemed severe, we were to bring them to the emergency clinic. I thanked the lady and called Doug back. "Do the dogs seem overly hyperactive?" I asked. "Yeah, they keep barking and jumping around because the doorbell keeps ringing with trick-or-treaters." I realized this conversation was going nowhere and decided to focus on my 5 mph drive. Finally I arrived home. Doug had locked the dogs outside so he could pass out what was left of the candy without the dogs rushing the door and scaring the little kids. It was after 9 when we turned off our porch light and let the dogs in. With all the excitement of the night, and being on a sugar high, they were a bit wound up. "What do you think?" the nervous mom in me kept asking Doug. He pointed out there was little we could do. We went to bed at 10 and I decided we would keep the bedroom door open so the dogs could go out if they needed to relieve themselves, and that the dogs could sleep on the bed so that we could tell right away if something was wrong. At 2:30 in the morning I woke up to get a drink. Crawling back into bed, I reached down to pet Allegra. No movement. I felt her chest for breathing and a heartbeat and couldn't feel it. I put my head on her chest, I didn't hear anything. I became frantic, thinking I had a dead dog on my bed. I called her name and suddenly she lifted her head, banging me in the forehead with her cone. She was alive, just very much asleep. I then turned my attention to Dante, who was very much alive and wanted petting. It's now afternoon and the dogs seem fine. I haven't noticed any of the symptoms I was told to look for. They have survived their Halloween treats and have tricked their mom into worrying about them.